Mona, who is an American model is shooting a film in Ghana. She is filming at Cape Coast Castle which she was not aware was a point of African slave trade. 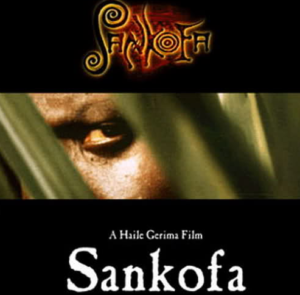 She is introduced to Sankofa who is a highly well known and respected Ghanaian musician. Mona has a flash back to the past where she was a house servant named Shola on a plantation in the South of the United States. Her slave owners were highly abusive. Nunu, who is an African-born field worker, and Shango, a lover of Shola who is originally from India, rebel against the slave trade. Nunu develops a major conflict with son who is of mixed race and has been deemed a head slave. Shola is incredibly inspired by Nunu and Shango and their will to fight back against the slave system. After her trials, Shola has a flash back to the present as Mona, now highly aware and understanding of her African roots. Barlet, O., & Thackway, M. (2013). Teza by Haile Gerima (review). Black Camera, 4(2), 163-164. Haile gerima: 'new black cinema' prophet. (1978, ). New York Amsterdam News. Boyd, D. (2012). In conversation with Haile Gerima. JALA: Journal of the African Literature Association, 6(2), 207-219. Reid, M. A. (2005). Haile Gerima: 'sacred shield of culture'. (pp. 141-153).